Point O’Ritz is a traditional special event at Point O’Pines. 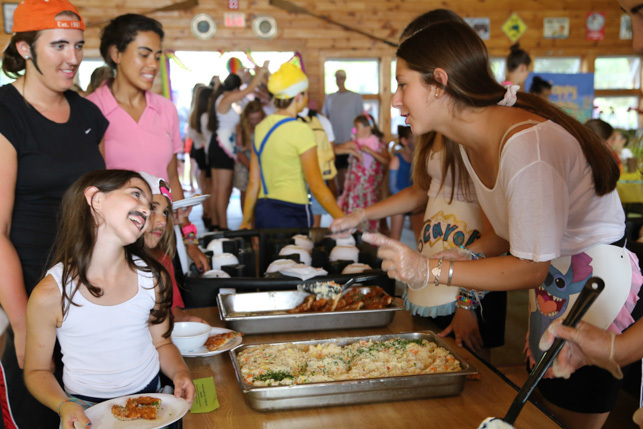 Following an amazing breakfast “break-out” in a dining room full of laughter, cheers and costumes, the campers returned to their bunks and agreed on a bunk costume theme. Campers used arts and crafts time to prepare the costumes for the big event. At 5pm, we all enjoyed a grand costume parade on the main lawn with hors d’ oeuvres, and soft drink cocktails. Campers awaited a special entrance from our costumed Seniors and then our Area Heads. The costumes were followed by a special dinner where our Peakers greeted every camper at entrance and served them from a spectacular buffet. Following dinner and our ice cream sundae buffet we headed to the theater for cabaret of talented staff. Wow! What a night! On Point O’Pasta night we bring the taste of Italy to the Point. 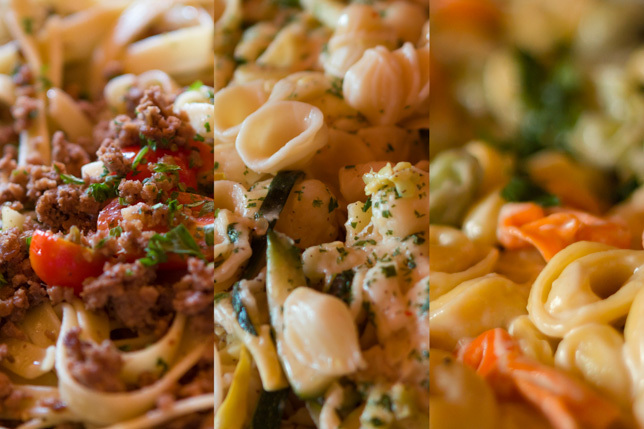 We feature a variety of fresh pastas we know the girls love that showcase a variety of farm fresh vegetables and ingredients for campers to try. Our camp chefs prepare the dishes as the campers venture through the buffet and our servers encourage them to try new things. Tortellini is always popular but the kids love oriecchiette, fusilli, farfalle as well. Our selection of breads and rolls freshly baked in our camp bakery and thickly sliced vine ripe tomatoes with fresh basil drizzled with extra virgin Italian olive oil serve as a delicious compliment to the meal. Close your eyes and dream. Our girls love fresh and natural foods prepared properly by our experienced chefs, and we like to encourage them to try delicious new foods. 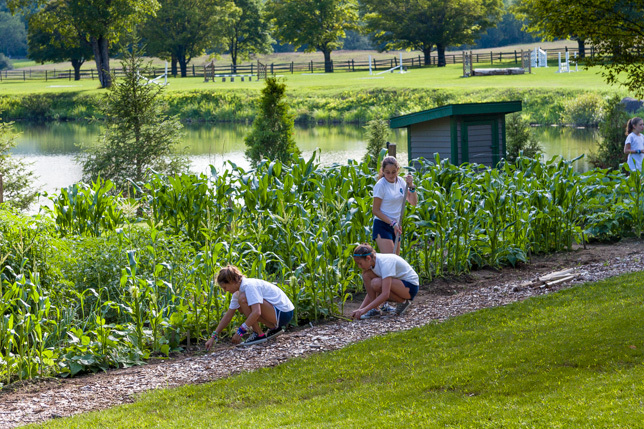 We use only fresh vegetables, and we even treat the girls to some produce grown on our own farm by our campers as it ripens. They love eating vegetables that they have helped grow. Most of our girls really love fruit. During a day at camp one can, of course, try bananas, oranges and apples, but we try to indulge our campers with many delicious and often new flavors. Frequently we experiment with different types of melons far beyond our regular honeydew and cantaloupe. Orange Flesh Honeydews, Casaba, Canary, Persian, Athena and other varieties often appear on our buffet. 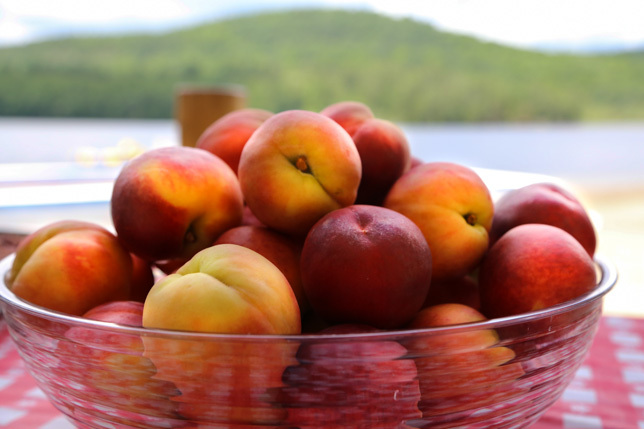 Peaches, Apples, Red Plums, Black Plums, Apricots, Nectarines, Strawberries, Blueberries and Cherries delight us as well. Fruit is available to our campers at breakfast, lunch, afternoon snack, dessert at dinner and at evening snack time. Wow, if you love fresh fruit you will have plenty to choose from.